I finally came around to record the promised tutorial on height mapping and auto-levelling G-Code files with a GRBL 0.9+ controller. In this tutorial I show how I go from a design in E.A.G.L.E. 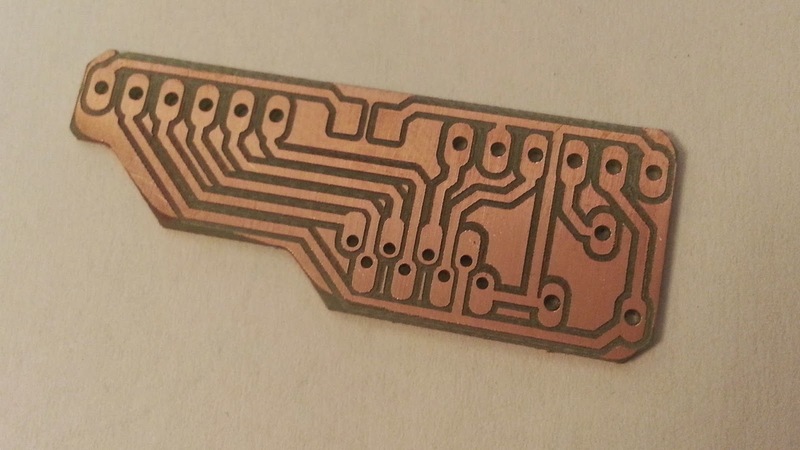 to a finished single layer PCB with traces narrower than 0.4mm using my custom toolchain to compensate for substrate unevenness. Be sure to read the readme included in the download, there are some more tips and tricks as well as a few instructions. The toolchain does not support arcs right now. This means that you have to use programs like GCodeRipper to convert all G2/G3s to smaller G1 moves. Since pcb-gcode does not use arcs this is no issue if you want to make PCBS. May get implemented in a later release. To see some more information on how your gcode file was parsed, select the file in the list on the left in HeightToGCode3. you will see some basic info as well as all lines that could not be parsed. Excellent tutorial. Well done. I have been looking for a way to do this on my homemade router. Now I can. Ausgezeichnet. Vielen dank fuer Vorfuehrung. Noch eine kurze Frage: Ich benuetzte Mach3. Ist GRBL damit kompatibel? Hi Mike, glad you like it! Mach3 iisn't compatible with my software, but you could take a look at http://www.autoleveller.co.uk/ or similar software which will work with your setup. Hi Martin, amazing job. What changes did you do at drill file to stop the machine and change the bits? I simply opened the file in N++ and copied the individual operations to seperate files. Also, there is quite a lot of code that can be removed if you only use GRBL to interpret it. I really don't know what's up with 0.9i and at the moment I can't easily test it. Does it still work with 0.9g? how do I hook up the two wires to the arduino when running the height probe software? great work! one question: I am intrigued by the way you hold down the work piece. I looks like you added something that has threads ("Gewinde") in the wood board on the CNC. What are they called? What keeps them from rotating when you screw in the bolt from the top? Thanks, you're looking for threaded inserts. Basically, it's an adapter from very coarse "wood" thread to a standard M6 machine thread. Thank you!!! :-) Much better than having to push a bolt through a hole from the bottom every time. So far I've been holding pre-cut boards on a jig that I level by milling it, unfortunately I need to re-mill a jig for each change of board, or if I've removed and then replaced a jig, which is much more time consuming than your method! Great! If you have any questions or suggestions be sure to leave them on the github issue tracker! Have you this model ? Excellent stuff. I'm rather new to this G-Code stuff. Does your app query the GRBL device for axis steps per mm on connection? Just wondering how that is done. thanks! grbl acts as an abstration layer so my app only sees the position in mm. no need for resolving step counts. I am attempting to use the app but I am a bit confused by the offsets setting in the height map dialog. Are those for the size of the board? At the moment, the probe just descends until it crashes. Martin. This is pretty sweet. We got a lot of it working but, I assume I have to GENERATE HEIGHT MAP prior to loading my Gcode file. When I attempt to create the height map I get an error "An object of type convertible to "double" is required." We're stuck there. Are you doing a cast or something that I need to change in the code? great to see that you stuck around and got it to work so far. The "Generate" dialog is only there for testing purposes. Say you want to test the app without having to fire up your machine. The dialog takes a mathematical expression (2D scalar field) to create fake height maps. If you actually want to probe something, you have to click "New" and enter all your parameters there (size, gridsize and offset). The sofware is clever enough to only probe empty spots in the grid which makes pausing and resuming (even after closing and re-opening the app) possible. The offset is basically the most bottom-left coordinate of the probed area. Grid size and point count then make up the size of the board. are you using the Arduino ? Hello, When I started the program, as soon as it touches the surface for 1st time (first point) the program says "Completed¨ and it hangs. Have you any advice? I´m using gbrl 0.9, connecting the wires to A5 and gnd. Hey, how and what files do I add to Arduino library?